It's the only way to contain the fey curse that scars her cheek. The Great War is five years gone, but its scattered victims remain the ironskin. When a carefully worded listing appears for a governess to assist with a "delicate situation" a child born during the Great War Jane is certain the child is fey-cursed, and that she can help. Jane knows Rochart cannot love her, just as she knows that she must wear iron for the rest of her life. But what if neither of these things are true? Step by step Jane unlocks the secrets of a new life and discovers just how far she will go to become whole again. TINA CONNOLLY lives in Portland, Oregon, with her husband and brand-new baby boy. Her stories have appeared in Strange Horizons, Fantasy, Beneath Ceaseless Skies, Highlights Magazine, and the anthology Unplugged: Year's Best Online SF 2008. Her Young Adult dystopia play, Witebox, will premiere in Portland in 2013. Connolly is a frequent reader for Escape Pod and Podcastle, and works as a face painter, which means a glitter-filled house is an occupational hazard. 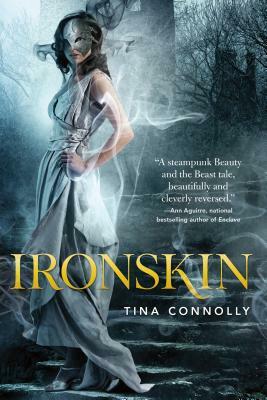 Ironskin is her first novel.